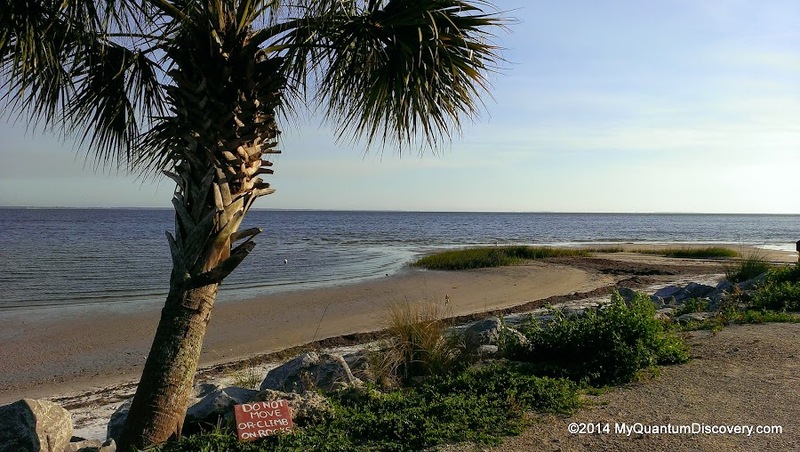 From St. Andrews State Park, we made our way to revisit another park we had stayed at previously this year – Ho Hum RV Resort in Carrabelle. It would be a little over a two hour drive along the coastal US-98E the entire way. Can’t say I was sorry to say goodbye to the Spring Breakers in Panama City Beach, not that we had any issues with them, there was just a lot of congestion and traffic in certain areas. The uneventful drive was fairly scenic, running along the coast and passing through several small towns such as the resort town of Mexico Beach. After checking in at Ho-Hum we made our way to our beachfront site #39. Ah yes, just as we remembered, a gorgeous view! 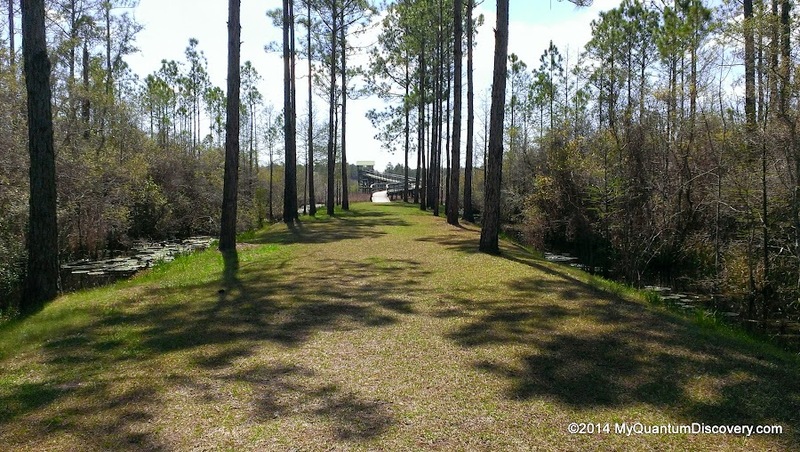 Here’s our detailed review of Ho Hum RV Park complete with Dash Cam video. It was definitely a ho-hum kind of stay. I was feeling a little under the weather for the first two days so we didn’t do much, just relaxing (of course, Rob had to relax to keep me company) and actually sitting outside by the beach reading, something we rarely ever do. We did take a couple of walks along the beach but we were a little nervous about it. When we checked in, the woman at the desk had told us to be careful of the bears – it was spring after all. Of course, we saw all sorts on prints on the sand. Most likely dogs but we couldn’t help but let our imaginations run wild. She also mentioned that an alligator had come ashore and had crawled up under someone’s coach. Calls were made and the alligator was removed. Hopefully he was just relocated to a better habitat away from humanoids. 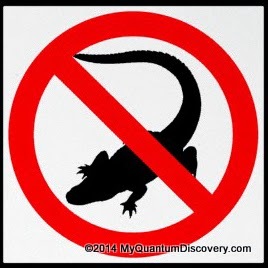 Perhaps they should put up a “No Alligators Allowed” sign so the creatures know better. There was one thing we did want to do – we had read about it during our stay earlier in the year but the weather at that time dampened (both literally and figuratively) any thoughts of an excursion. 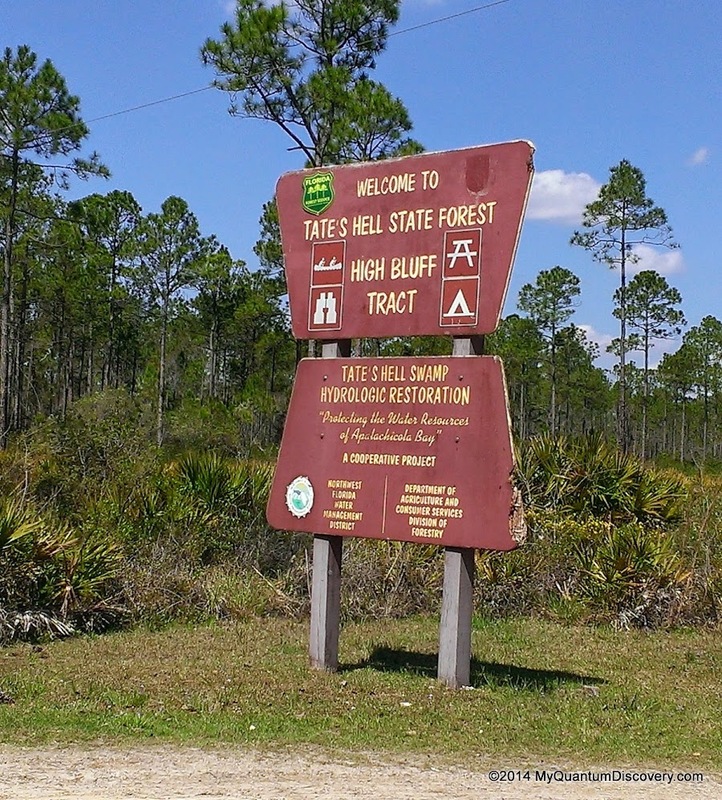 And another article explains that “Florida bought the 202,437-acre property in 1994. 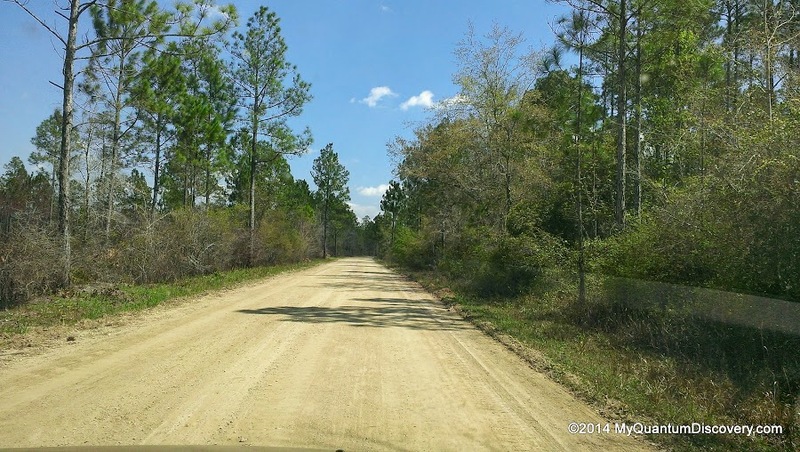 40 years of private ownership prior to that had seen more than 800 miles of roadways and drainage ditches built on the land to accommodate the commercial interests of a major timber corporation. 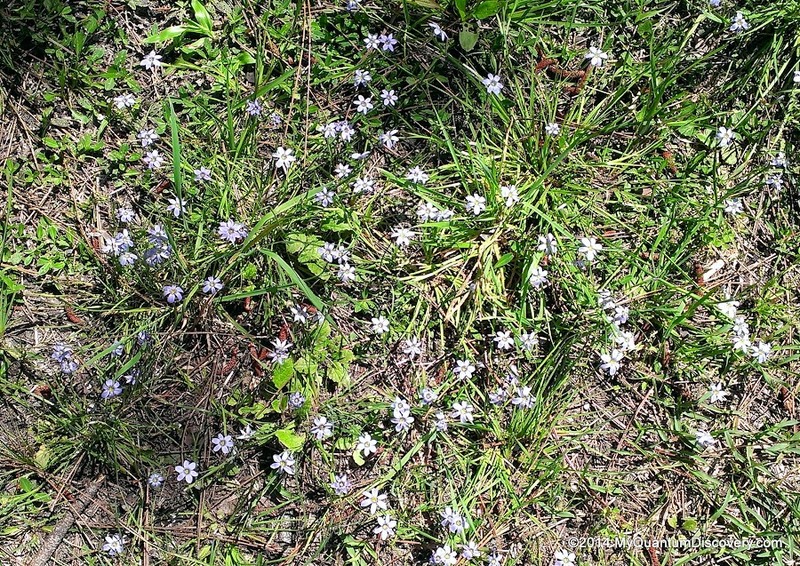 Where previously there had been floodplain forest and swamp, wet prairie and flatwoods, baygall, seepage slope, basin swamp, sandhill, upland hardwood forest, dense titi thickets, pine ridges and scrub, most of the area had been drained and the vegetation converted to a pine monoculture. This caused a huge loss of varied habitat and the wildlife that goes with that. It also caused major changes in the water flow from the Apalachicola River into Apalachicola Bay (Apalachicola Bay is a Florida State Aquatic Preserve with shellfish propagation and harvesting as its primary designated use – the Apalachicola River is a designated “Outstanding Florida Water,” and is managed for the propagation and maintenance of a healthy and well-balanced mix of fish and wildlife, with a side helping of recreation). 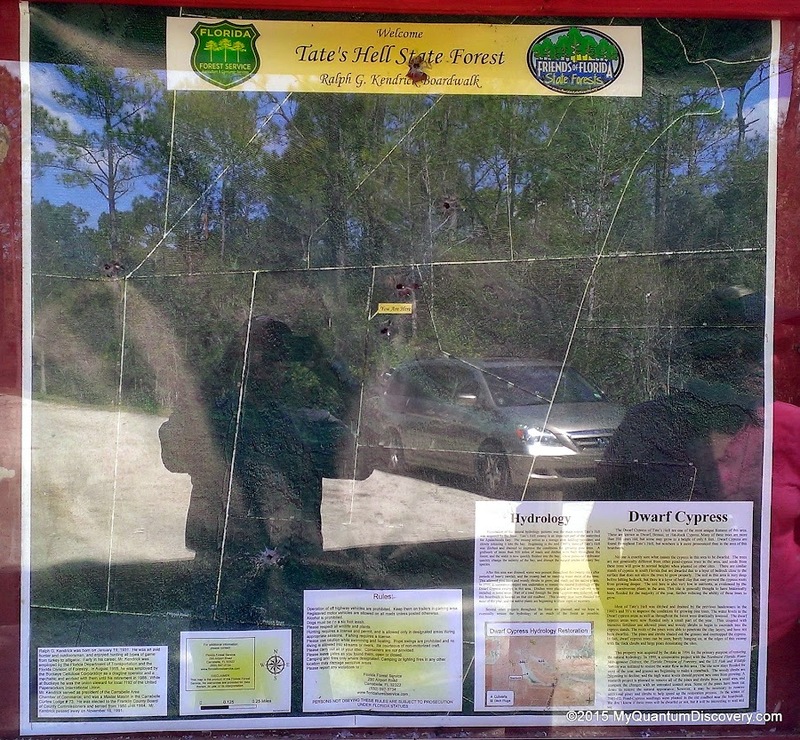 Several stands of dwarf cypress, also known as “bonsai”, “miniature” or “hat-rack” cypress live in Tate’s Hell State Forest. Some of the trees are well over 150 years old but none are taller than about 15 feet. The Ralph G. Kendrick Boardwalk has an observation tower overlooking one of the areas where these dwarf cypress trees grow most prolifically. Sounded interesting and definitely worth a visit! 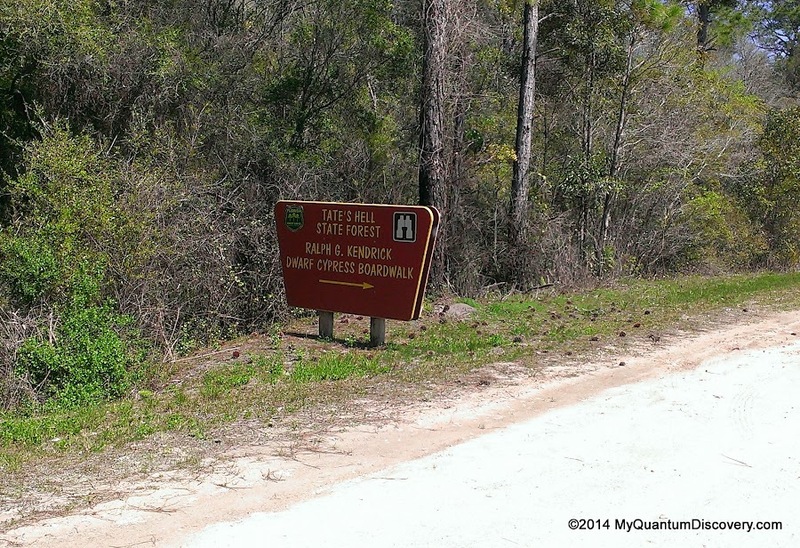 Although we had seen a sign for the boardwalk along US-98 several miles from Ho-Hum, we weren’t sure about that entrance and followed some other directions we had found on a website. 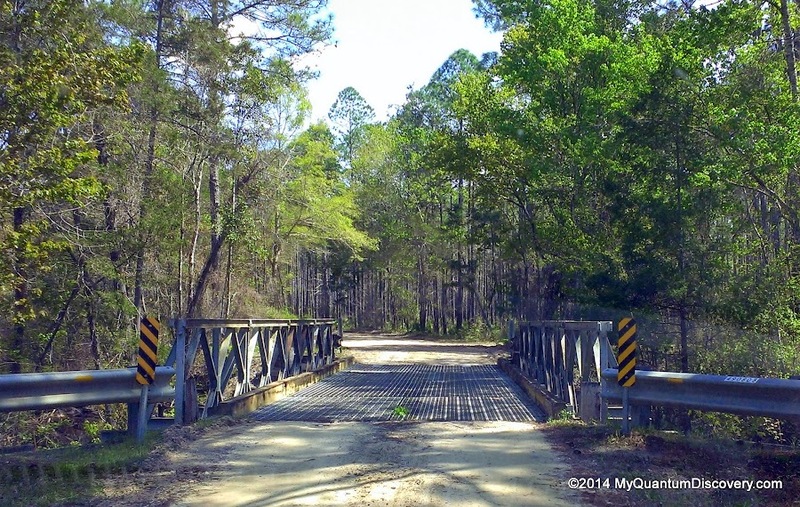 From US-98 north, we took US Highway 65 for 5.5 miles, then turned right onto North Road traveling 1.7 miles, then turned right onto Dry Bridge Road for another 2.7 miles to the boardwalk access road for a total of 4.7 miles on unpaved roads. Here’s the route from the beginning of North Rd and US-65 to the boardwalk parking area. 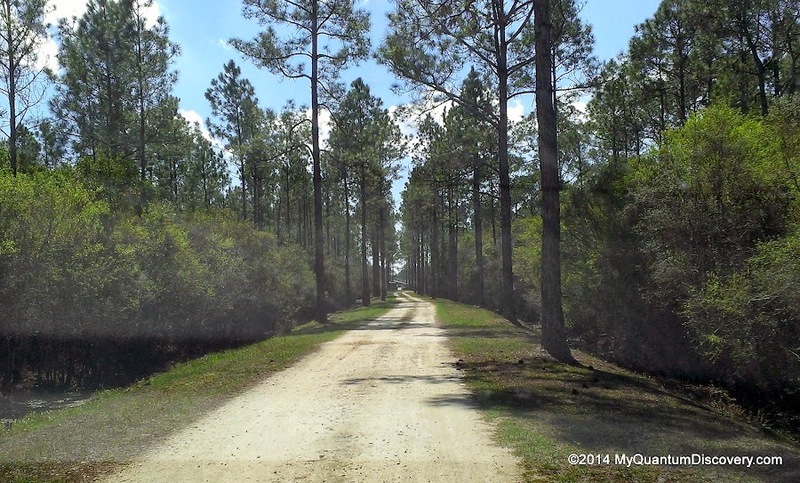 You can also get to the boardwalk from US98 by entering here and following this route, a total of about 6 miles on unpaved roads. Both options are marked with appropriate signage along the way going in, but we recommend enabling the “cookie crumb trail” on your GPS or running a tracker like My Tracks so you can retrace your path and don’t get lost on the way out. You wouldn’t want to suffer the same fate as Tate and get trapped in hell! Best to do this trip during dry times as I imagine the dirt roads could get rutted and muddy. Even though it was dry when we were there, the road still had some isolated washboarding and potholes, hate to think what it would be like after a rainstorm. Reminded us a lot of the dirt lane that we used to live on back in Massachusetts. Once we parked the van and read the information signs (riddled with several bullet holes BTW), it was a short walk to the boardwalk. Who would have guessed that there would be a boardwalk out here in the middle of nowhere! No one else was around, just the three of us – Rob and I and Mother Nature. Very peaceful! (and maybe a bit spooky because of the bullet holes). 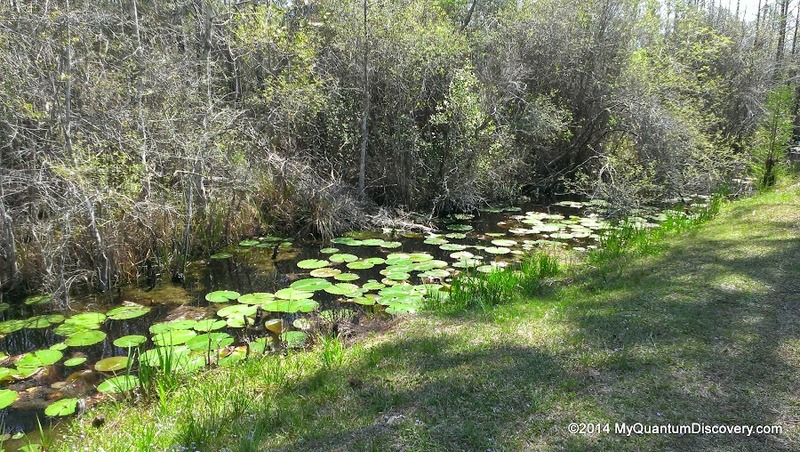 To either side of the grassy walkway to the boardwalk was water, hardly visible due to all the lily pads. Must be pretty when they are all in bloom. Several large turtles quickly slid into the water at the sound of our footsteps, darn didn’t have time to get any pictures. I figured we might see some other wildlife, perhaps an eagle or a gator or something but no such luck. 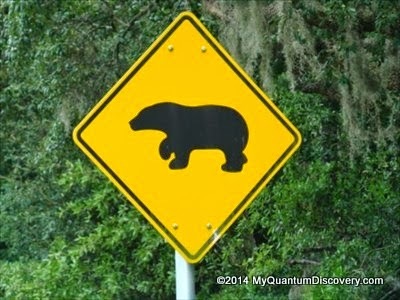 Just as well, in the Carrabelle/Eastpoint area there are bear signs everywhere. Sure wouldn’t want to meet up with one of them, or the low life that put the bullet holes in the sign either! Once up on the observation platform, we both exclaimed “wow” at the same time. It wasn’t that it was particularly pretty, it was just different, kind of weird in a way, seeing all these stunted trees against a far distant backdrop of taller pines. In the photos it just looks like a bunch of dead trees – the pictures don’t really do the scene justice. But standing there, each tree seemed to have it’s own personality posing with a uniquely individual and whimsical stance, totally shaped by the environmental elements. Since it was still winter, there was no foliage on the trees but it was a pretty cool scene anyway. Must be really awesome in the summer when it is a mass of greenery. No one is exactly sure what causes the cypress in this area to be dwarfed. 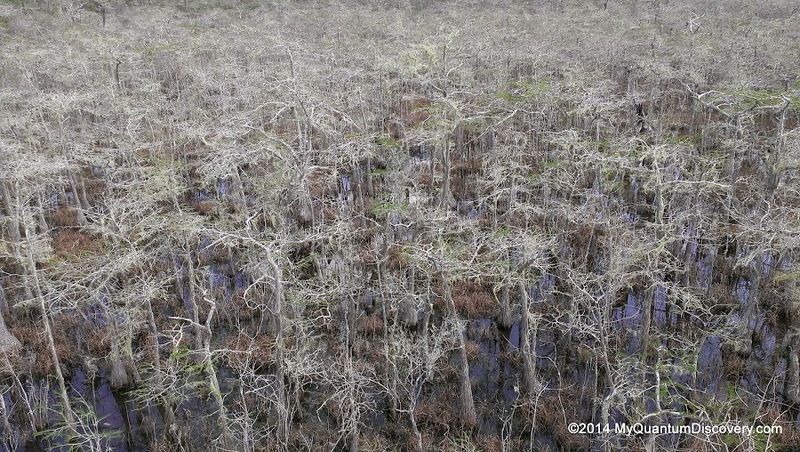 The trees are not genetically different from other pond-cypress trees in the area, and when planted on other sites, the seeds from these trees will grow to normal heights. Some theories speculate that it is because the soil in this area is very deep before hitting bedrock, but there is a layer of hard clay that may prevent the cypress roots from growing deeper. After hanging out for a bit, it was time to leave. 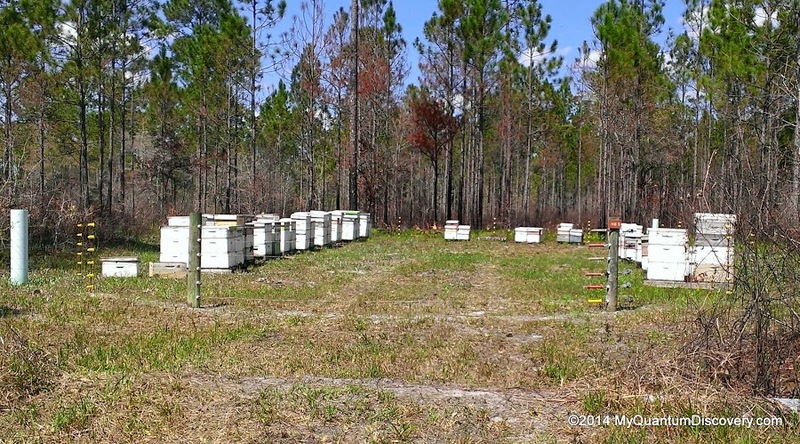 Along the dirt road, in the middle of nowhere, was a small area that had a bunch of bee hive boxes. Strange as there were no houses or anything nearby but I guess bees don’t need someone constantly watching over them. As I rolled down the window to take a picture, I could see the bees buzzing around off in a distance. Rob kept yelling “hurry up, roll up the window”. Probably good advice since I almost died when I was stung by a bee in the 3rd grade. Turned out I was highly allergic to bee stings and thanks to my quick thinking and acting mother, I survived. But I had to go through extensive desensitization shots for several years which as a child was sheer torture. Must be why I don’t like needles to this day. Recent tests thankfully have shown though that I no longer have an allergy but I certainly didn’t want to ruin our day and find out! Update December 2016 – this restaurant is permanently closed. On the way back, Rob decided it was time for lunch and pulled into the parking lot of Bayside Burger, Home of the Tate’s Hell Burger. We both remembered that someone at Ho Hum had raved about the burgers here during our last stay but we weren’t sure of the name of the place. Not many burger joints around so this must be it. Let’s see if they were right. 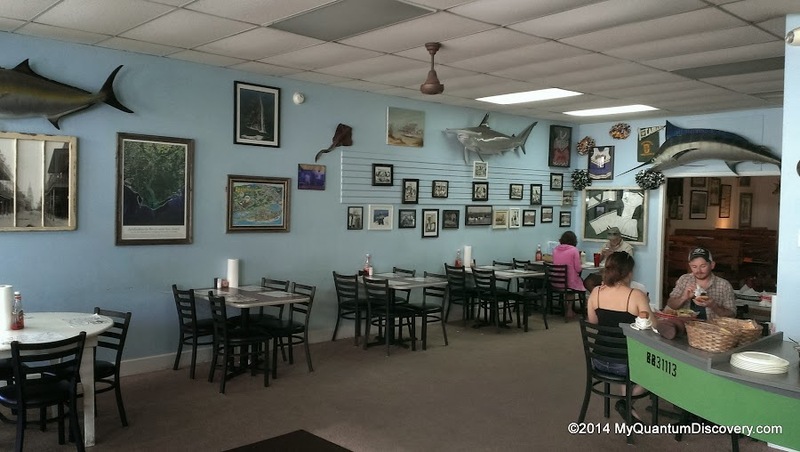 Not just a burger joint but a good selection of other things as well – mostly fried stuff – oysters, mullet, etc. As our waitress gave us our menus, we asked her what was good and she recommended the Cowboy Burger ($8.95), topped with bacon, cheese, onion and barbeque sauce. Okay, we’ll have two of those please! French fries, tater tots or onion rings? I totally love onion rings so that was my choice, Rob had the tater tots. Oh my, the burgers must have been at least 1/2 pound or more, so big it was hard taking a bite but oh so tasty. My onion rings weren’t ready yet so she brought a huge basket of them a few minutes later – perfectly cooked in a nice light batter! Couldn’t finish them all so we had leftovers. Tater Tots were good as well. 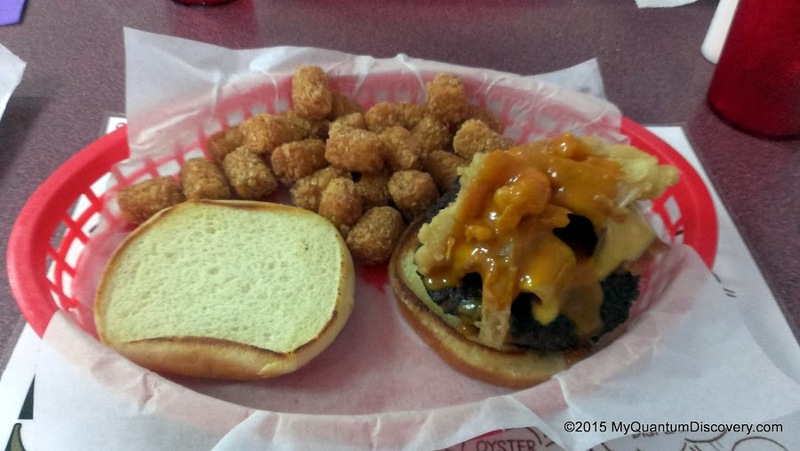 If you are in the area and are in the mood for a burger, definitely stop by. 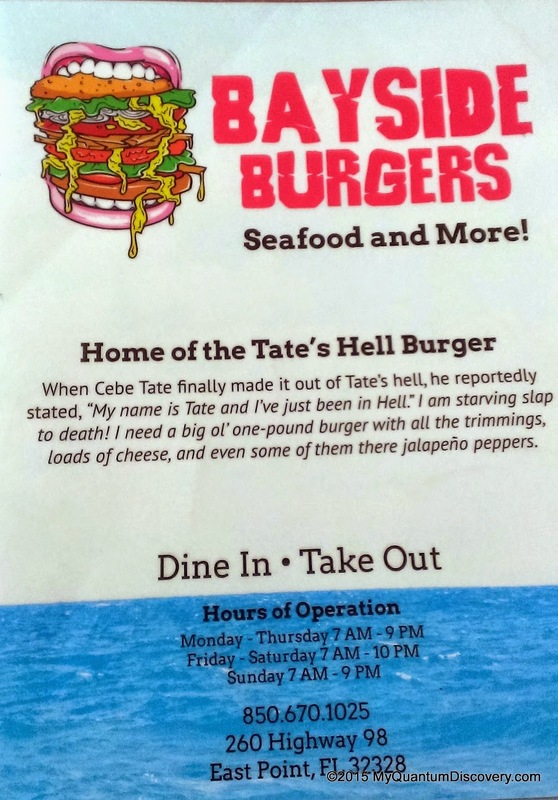 Oh, by the way, you’re probably wondering what a “Tate’s Hell Burger” is – it’s 1 pound of beef, loaded with cheese and jalapenos and all the fixin’s. Bet it sets your mouth on fire, thus the reason for its name. We had one more stop to make but I’ll write a separate post about that. Once back at the coach, we sat outside enjoying our last evening listening to the waves and watching the pelicans. Then we enjoyed an excellent St. Patty’s Day dinner of Corned Beef and Cabbage (minus the green beer) which had been simmering most of the day in my Cuisinart Multi-Cooker while we were gone. What a perfect ending to a perfect day! It was our last night on the water, when we left the next day we headed inland to another familiar spot. Can you guess where?